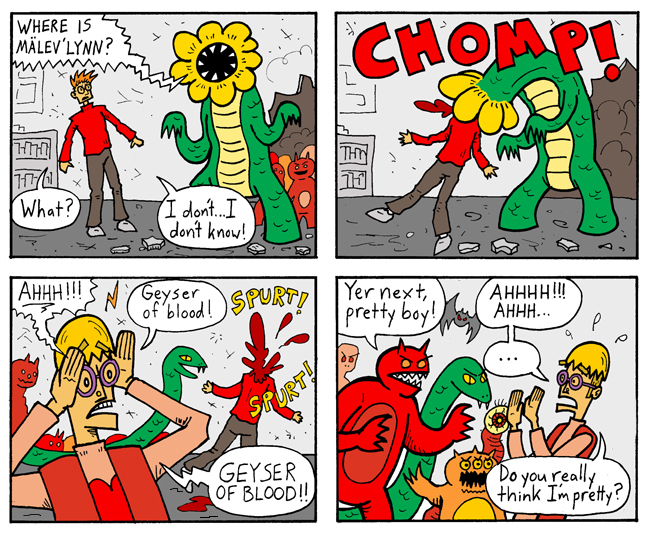 Is that the most graphic violence I've shown in this strip? I think so. More importantly, this is episode #233, which means it's been FIFTY EPISODES since the Great Jumping-On Point for New Readers debuted a little over a year ago. It had been eight years since I had drawn this comic on a regular basis, and I wanted to prove that I could still do it. And apparently I can. In other news, I drew this illustration of the city Ersilia over at the Seeing Calvino tumblr. This is my ninth illustration so far. Check 'em out! Next Week: More demons! More violence!